Glass II at La Triennale di Milano. Top view of the three columns in high brightness mode. Designed and constructed by the Mediated Matter group, MIT Media Lab. We present G3DP2: a high-fidelity, large-scale, additive manufacturing technology for 3D printing optically transparent glass structures at architectural dimensions. This enabling technology builds upon previous efforts led by the Mediated Matter group—through G3DP2—to 3D print optically transparent glass for product scale applications. G3DP2 transcends its predecessor by restructuring the machine’s architecture and process control operations as informed by material properties and behaviors of silicate glass to 3D print building components with tunable and predictable mechanical and optical properties. This new manufacturing platform includes a digitally integrated thermal control system—to accompany the various stages of glass forming—as well as a novel four-axis motion-control system permitting flow control, spatial accuracy and precision, and faster production rates with continuous deposition of up to 30kg of molten glass. GLASS II from Mediated Matter Group on Vimeo. To demonstrate GLASS II’s capabilities, the Mediated Matter group presents an installation for Milan Design Week debuting at the Milan Triennale on April 4, 2017. 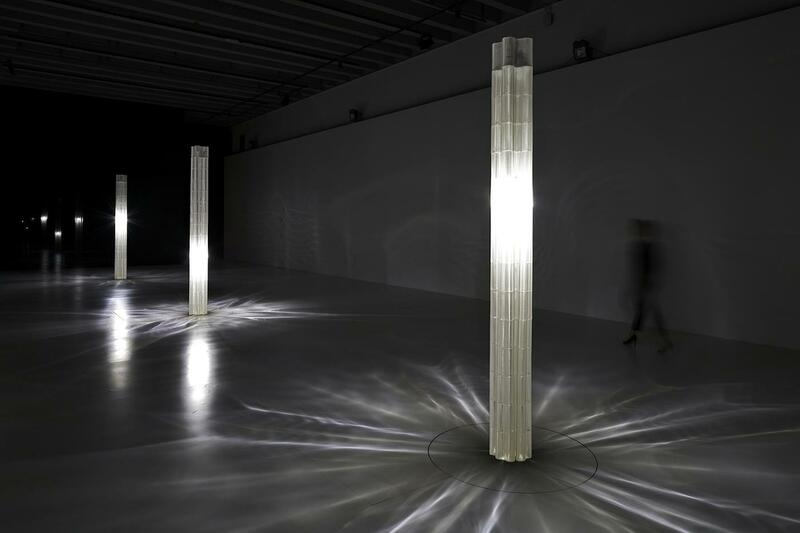 The installation is comprised of a series of 3m-tall glass columns fully manufactured with the GLASS 2 platform. Each column’s unique and constantly changing surface is the result of continuous branching into multiple lobes to support its load. For each, a unique network of radial arrays made of arcs; to each, a unique caustic footprint corresponding with its mechanical properties. Given their geometric complexity and dynamic optical properties, the columns act as architecturally scaled lenses that can concentrate or disperse light from within and/or outside the glass surface. Chikara Inamura (project lead), Michael Stern, Daniel Lizardo, Tal Achituv, Tomer Weller, Owen Trueblood, Nassia Inglessis, Giorgia Franchin, Kelly Donovan, Peter Houk (project adviser), Prof. Neri Oxman (project and group director). Klein, J. "Additive Manufacturing of Optically Transparent Glass"